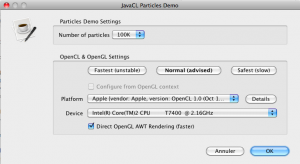 JavaCL (and OpenCL4Java) v1.0-beta-5 is available ! Now using a nice configuration dialog when launching ParticlesDemo : has optional OpenCL settings with “Fastest”, “Normal” and “Safest” presets + detailed platform and device choice (with optional OpenGL sharing choice). Fixed issue #18: CLImage.write calls enqueueImageRead ! Additionally, an experimental of JavaCL from JNA to BridJ is now available from the Downloads. While it shouldn’t be considered for production use, it passes all JavaCL automatic tests, runs the demos fine, is smaller (JAR weighs 750 kB instead of 1.8 MB) and presumably marginally faster (overhead per-function call about 5x smaller). Feedback on this prototype would be highly appreciated : to test it you just have to exchange javacl’s jar with the javacl-bridj JAR (no API change at all).